Calcium balance is maintained through complex physiology in the intestine, kidney, and bone. Calcium from your diet or supplements is absorbed from the intestine into the blood. Some calcium may be deposited into bone, while the kidney filters calcium in blood. In the kidney, calcium is either reabsorbed back into the blood or lost in the urine. Sodium lost in the urine drags calcium with it. Therefore, the more sodium out, the greater loss of calcium. Too much calcium in your urine may cause kidney stones and contribute to bone loss. People who eat high-salt diets are prone to developing kidney stones and osteoporosis. The exact mechanism causing the calcium loss is unknown. 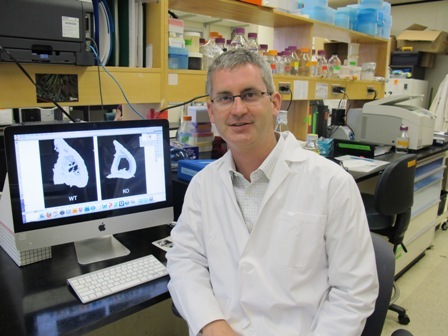 Recently researchers at the University of Alberta led by Dr. R. Todd Alexander found a possible answer. They reported in the journal American Journal of Physiology – Renal Physiology a molecular link between sodium and calcium loss. Using cell and mouse models, they observed a molecule (the epithelial sodium/proton exchanger, NHE3) that is known to be responsible for sodium absorption in the body also played a role in regulating calcium levels. The researchers worked with mice models that didn’t have this important molecule. As a result, the animals’ urine contained high levels of calcium because calcium was not reabsorbed and retained. In addition, the intestinal absorption of calcium was reduced. The bones of these mice were small and thin. Their experiment proved this sodium-regulating molecule plays a critical role in calcium balance, too. Higher sodium loss linked with calcium loss through this molecule results in bone loss. Their findings reinforce why it is important to pay attention to your salt intake for your bone health. Most Americans consume too much in their daily diet. You may be surprised by the foods that are high in sodium. Learn more about those foods in the Top 10 Sources of Salt in Your Diet. Remember sodium and calcium are linked. Next time, pass on the salt for your margarita! Source: Pan W, Borovac J, Spicer Z, Hoenderop JG, Bindels RJ, Shull GE, Doschak MR, Cordat E, Alexander RT. The epithelial sodium/ proton exchanger, NHE3, is necessary for renal and intestinal calcium (re)absorption. Am J Physiol Renal Physiol 302: F943–F956, 2012.